Let your child's imagination loose with one of our playsets! Children's play sets, swings, swing sets, gym sets, club houses, and playhouses help keep active children wonderfully occupied. From this kind of play children acquire coordination, good balance, and proper muscular development. They also learn about playing safely and cooperatively with others. 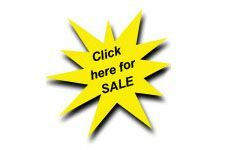 Click here for more information on large playground equipment sets designed specificially for communities, schools, churches, swim clubs, and parks. Children's Vinyl Play Sets, Swings, Slides, Rock Walls, Climbing Towers, Sandboxes, and more. Mix and Match features to customize your very own set. 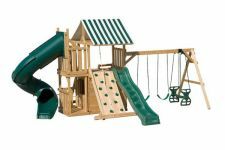 Children's Wood Play Sets, Swings, Slides, Rock Walls, Climbing Towers, Sandboxes, and more. Customize your set by mixing and matching optional features. 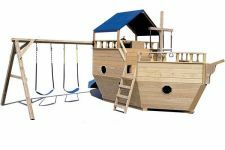 Children's Wood Playground Equipment: Arks, Boats, Ships, Monster Trucks, Jeeps, Tractors & Wagons, Airplanes, Wood Trains, Forts, and Castles. Add swings, slides, rock walls, telescopes, wheels, and more to complete the set. 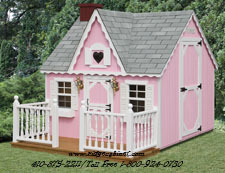 Children's Wood Painted Playhouses, Club Houses, Log Cabins, and Cottages. End of Summer display and sale models! 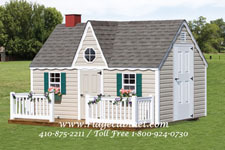 Playhouses are available with wood or vinyl siding. Play systems and swing sets are available in vinyl and wood. The structural timbers and bars that we use in our wood sets are quality selected from exterior-use pressure-treated pine which is kiln dried to reduce warping. Corners are rounded for safety to reduce the chance of splinters. Hardware is planted to resist rusting and swing bearings are made of nylon for a long, "quiet" life. Also, our sliding boards are made of durable plastic for safety, comfort, and quality. 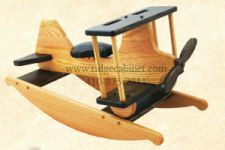 These swing sets and playhouses are not only built of quality materials, they are also built well. Wide bases insure that units will not tip over. Each is engineered and built with your child's safety in mind. All standard sets are 7'6" high and 14" long. We are now using Natural Select Wolmanized Wood to build our wood play systems, you can get more info visiting their web site at www.wolmanizedwood.com. Natural Select Wolmanized Wood is an effective alternative to traditional treated lumber. It is recommended that all wood parts be given and application of a good wood preservative to protect its smooth finish and natural beauty. It is also recommended that the bolts be checked and tightened periodically. Remember, your set will last a long time, if it is maintained properly.